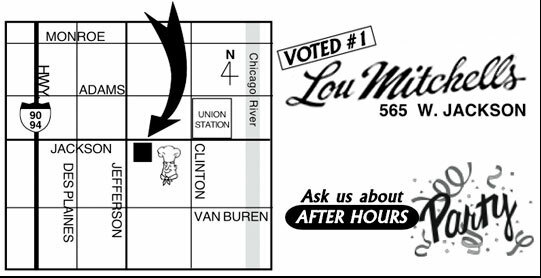 What’s the best way to get to Lou Mitchell’s? Take the Eisenhower (I-290) to Canal Street. Exit on Canal Street, turn right (West) onto Harrison. Take Harrison to Jefferson, turn right (North) onto Jefferson. Turn right (East) onto Jackson. We are located on the Southeast corner, one door East of Jefferson. Take the Stevenson (I-55) to the Kennedy (I-90). Exit on Madison, turn right (East). Take Madison to Des Plaines, turn right (South) onto Des Plaines. Take Des Plaines to Jackson, turn left (East) onto Jackson. We are located on the Southeast corner, one door East of Jefferson. Take the Kennedy (I-90) to Jackson. Turn left (East) onto Jackson. We are located on the Southeast corner, one door East of Jefferson. Take the Dan Ryan (I-94) which turns into the Kennedy (I-90) downtown. Take the Kennedy (I-90) to Madison. Exit on Madison, turn right (East). Take Madison to Des Plaines, turn right (South) onto Des Plaines. Take Des Plaines to Jackson, turn left (East) onto Jackson. We are located on the Southeast corner, one door East of Jefferson. Exit on Grand. Take Grand West to Des Plaines. Turn left (South) onto Des Plaines. Take Des Plaines to Jackson, turn left (East) onto Jackson. We are located on the Southeast corner, one door East of Jefferson. Exit on Roosevelt Road. Take Roosevelt Road West to Jefferson. Turn right (North) onto Jefferson. Take Jefferson to Jackson, turn right (East) onto Jackson. We are located on the Southeast corner, one door East of Jefferson. There are public parking lots, as well as PayBox street parking. Please note that there is restricted parking on Jackson, as well as parking restrictions on Jefferson on Thursdays and Fridays.